Scott Madden, owner of Madden Timberlands and president of the PLC, addresses the graduates and attendees at the Mechanized Loggers Program graduation Sept. 22. 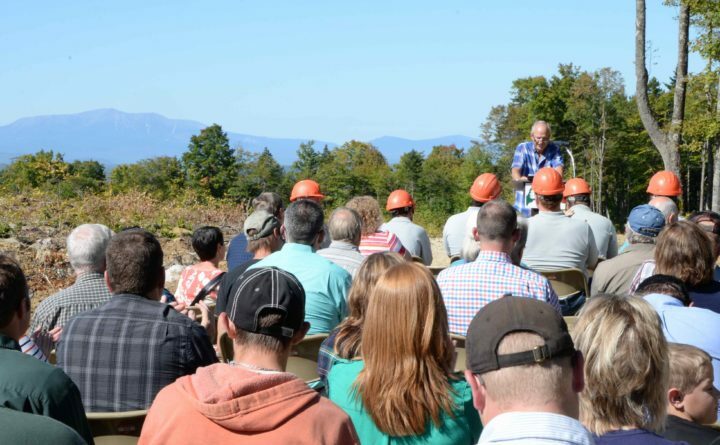 The first graduates of Maine’s new post-secondary training program for operators of mechanized logging equipment were recognized Sept. 22 at a ceremony held in the woods south of Medway where they spent weeks harvesting timber using sophisticated state-of-the-art machines like those they will encounter in the logging industry. The new program was launched this summer thanks to a partnership between three Maine community colleges, the Professional Logging Contractors (PLC) of Maine, and industry partners including Milton CAT/CAT Forest Products and Nortrax Inc./John Deere. While the logging industry has seen some contraction in recent years due to the loss of pulp and paper mills, the demand for skilled operators of the feller bunchers, harvesters, grapple skidders, forwarders, delimbers, and other mechanized logging equipment that now harvests approximately 95 percent of all timber in Maine is strong. Many current operators are reaching retirement age and the steep costs of training new operators is driving up demand and wages. The post-secondary program began June 19 in Millinocket, in conjunction with Eastern Maine Community College, and will rotate to other locations around the state as each class completes it. The hands-on experience students gained operating equipment for weeks in the woods is something unavailable anywhere else in Maine and neighboring states. It generally takes at least a year of training and experience before an operator becomes skilled enough to run this equipment safely and efficiently. The cost for companies to train these operators themselves is approximately $100,000 each. The program was jointly developed by the PLC and Northern Maine Community College (NMCC), Eastern Maine Community College (EMCC), and Washington County Community College (WCCC). Maine’s lawmakers made funding available for the program through the ‘Put ME to Work Program’ to support creation of new job training programs at Maine’s community colleges. It enjoyed bipartisan support. Other support came from Acadia Insurance, Labonville Inc, Katahdin Fire Company, Eldon Pelletier, Steve Hanington, and Madden Timberlands Inc.